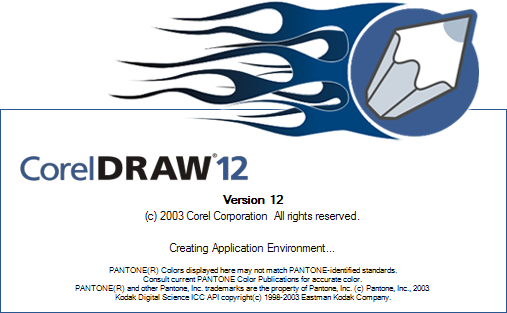 CorelDraw Graphics Suite 12 is a comprehensive suite that combines three main graphics applications. Included in the suite are CorelDRAW 12, a vector illustration and page layout application, Corel PHOTO-PAINT 12, a digital image editor, and Corel R.A.V.E 3, a motion graphics application. Also included are the design utilities CorelTRACE12, Corel CAPTURE 12, Bitstream Font Navigator 5.0, Microsoft VB for Applications 6.3, Kodak Digital Science color management system, and QuickTime 6.0 Player. This suite of powerful applications gives the graphic designer or photographer all the tools needed to bring the best out in their work, will enhance your productivity, and allow your creativity to shine through. The value and combination of these powerful tools just can’t be beat by any other graphics suite available in my opinion. All software in the graphics suite is integrated to work smoothly together. For example if you are working in Draw 12, and double click a BMP, the Photo-Paint application will automatically be initiated without ever having to leave Draw. Once you have edited your BMP and closed Photo-Paint you are automatically returned to Draw. Corel PHOTO-PAINT 12 has all of the high-end features and tools the photographer needs to have full control over image editing. It contains all of the important tools like curves, equalization, histograms, layers, objects, masking tools, cloning tools, etc. It also comes with a set of filters that is to large to list to add that creative edge to your images. There are also interactive drop-shadow tools, fill tools, transparency tools, etc. to round out this comprehensive image editing program. PHOTO-PAINT supports third party plug-ins to add additional filters to your editing tool-box. I have used many photo editors, but I find PHOTO-PAINT to be the most intuitive and comprehensive photo editing software available today. I feel many of the tools and concepts are easier to understand and use than in competitors software I have worked with. The concept of PHOTO-PAINT is a bit different than some other image editors. With Corel, every object is essentially its own layer and you can add transparencies etc., to each object without having to add new layers, although you can add layers just like in PS. Selecting areas of your images for non-global modifications is important for post processing of digital images and I find PHOTO-PAINT masking tools to be superior to all others I have used. Besides the general masking tools like the magic wand, lasso tool, etc, there is also a great masking feature in PHOTO-PAINT called the cutout tool which greatly reduces the time that used to be spent creating manual selections. The cutout tool does a great job masking or cutting out parts of your image even on difficult areas to mask like hair. There is also the ability to create masks based on selected color, shadows, highlights, etc., which I use quite often. My favorite new feature in PHOTO-PAINT is the touch-up brush. While cloning is very important for image editing to remove imperfections, it can be a time consuming process. PHOTO-PAINT cloning tools are the best there are as I have tried to use other editor’s cloning tools with less success than in PHOTO-PAINT. But the addition of the touch-up brush has saved me many hours editing areas that I would have used the basic clone tools in the past. The touch-up brush samples pixels around the area you want to clean up by blending the textures and colors surrounding the area you want to eliminate. There are strength settings you can use to control the amount of touch-up the brush will create. This eliminates the need to select a source point to clone from over and over again. PHOTO-PAINT contains a wide variety of effect tools and brushes that I find very useful. The blend and smear effect tools are two of my favorites. They can be used in touchup chores to effectively blend away those dreaded halos that form around edges when sharpening, or can be used to create wonderful painterly effects. Your creativity is the only limitation with what these tools could accomplish. The new version of CorelDRAW Graphics Suite 12 supports even more file types than before in order to streamline your workflow. It allows you to easily work with Microsoft Office, Scalable Vector Graphics (SVG), AutoCad, HPGL, Adobe Photoshop, Illustrator and Adobe PDF files to name a few. Industry standard file compatibility makes it easier to exchange files. Creating images for the Web with PHOTO-PAINT 12 is fun and easy. You can optimize an image for the Web before you export it to adjust its display quality, file size and more. You can also create rollovers which are interactive images that change in appearance when they are clicked or pointed to on the Web. You can also assign properties to a rollover, such as Web address that opens when you click on the rollover. These tools can be used to give your photography Website that extra punch! Graphics Suite 12 makes color management more intuitive by combining all of the essential color management options in one dialog box. There are 3 predefined color management styles to take advantage of, removing the guesswork of color management. You also have the flexibility of creating and saving your own color profiles. Import and export options to imbed ICC color profiles in various file formats like .jpg, .tiff, etc. ICC profile options so you can apply profiles to images that are acquired from a scanner or other TWAIN sources to ensure accurate color representations. Color profiles online integration to keep your color profiles up to date, you can retrieve and update from an FPT site maintained by Corel. Draw is a sophisticated illustration and page layout tool that has everything for the professional graphic designer. It contains a wide range of object creation tools, innovative effects, comprehensive text-handling capabilities, and high quality output features. Even if you are not a graphic designer, Draw is a valuable tool for the photographer. Create business cards, brochures, photo cards, or a logo for your photography business. With full integration of Photo-paint and Draw, the uses for the non-graphic artist are endless. Some of the new features of Draw 12 are Smart Drawing tools, new dynamic guides, and enhanced snap-to objects. The Smart drawing tool allows you to draw in a rough shape like a circle. It will then recognize the shape as a native object, and intelligently smooth the curves while you are drawing. The new dynamic guides allow the designer to significantly cut design time with temporary guides that let you lay out objects precisely the first time. The enhanced snap-to objects gives the designer visual feedback as you quickly and precisely draw or modify objects in relation to each other. These new tools along with the vast array of existing tools and effects make this illustration and page layout tool unequaled! Included with the suite are several very useful design utilities. CorelTRACE 12 is a bitmap to vector tracing utility that turns bitmap images into vector image for use in a vector illustration program like Draw. Corel CAPTURE 12 is an advanced screen capture utility that I find very useful. Bitstream Font Navigator 5.0 is a windows font manager that makes it easy to find and install fonts.